The buffet-style catering option is best for birthdays, office events, family gatherings, weddings, or just a large carryout meal. The food is sold by the pound and served in buffet-style containers. All food will be hot and ready to eat upon pickup, unless you request otherwise. This option is available for any size group and available for delivery. Please reach out to our catering team if you have questions about how much food to order. They’re happy to help! Please order a minimum of 24 hours in advance. 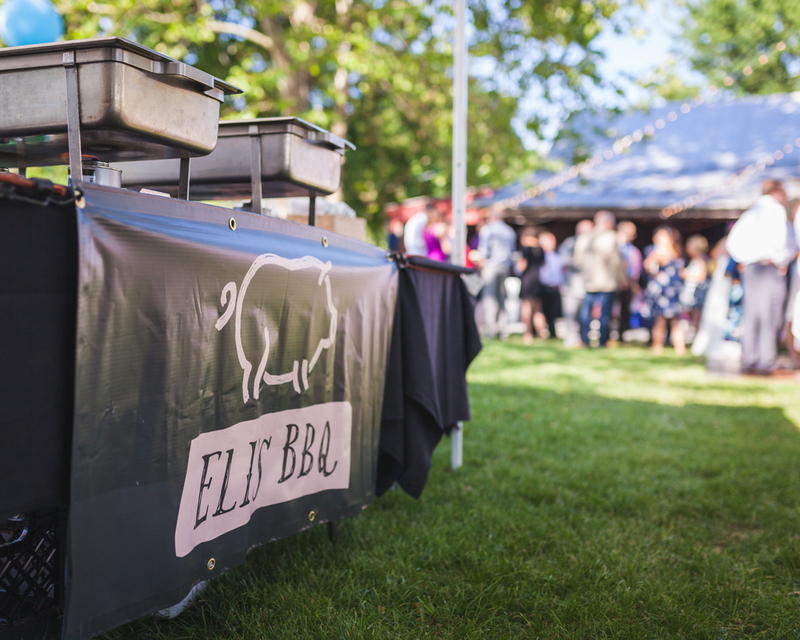 With the on-site catering option, Eli’s staff will set up our mobile kitchen, grill sandwiches to order, and facilitate buffet service for your guests. This option is an out-door only option that is available April through October. On-site catering dates are limited, please order at least 2 weeks in advance to check for availability. A signed contract and deposit are required to hold the date. A labor charge will apply. Guests receive a hickory smoked pulled pork sandwich served on a grilled bun and topped with Eli’s Signature BBQ sauce. Guests can choose between hickory smoked pulled pork or hickory smoked turkey breast served on a grilled bun and topped with Eli’s Signature BBQ sauce. Set oven to 225 degrees. Place pan in oven with the metal lid on. If given a plastic lid, replace it with foil. Stir occasionally to ensure even heating. Heat to 165° and serve. What are the recommended serving sizes? Are buns included like BBQ sauce is? No. They are $3 per dozen. Is on-site catering available year-round? No. It is available April–October. No. Outdoor space is required. We can, depending on availability. and a $500 minimum Fri–Sun. Do you roast whole hogs?